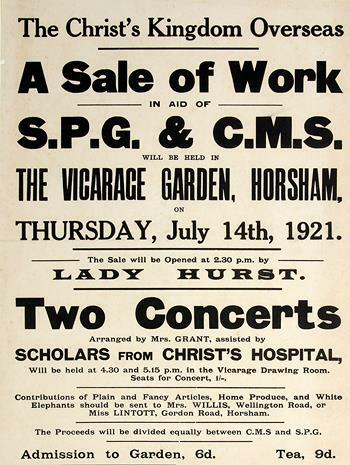 The Christ’s Kingdom Overseas – A Sale of Work in aid of SPG and CMS will be held in the Vicarage Garden Horsham on Thursday July 14th 1921. The Sale will be opened at 2.30 pm by Lady Hurst. Two concerts arranged by Mrs Grant, assisted by Scholars from Christ’s Hospital, will be held at 4.30 and 5.15 pm in the Vicarage Drawing Room. Seats for Concert 1/-. Contributions of plain and fancy articles, home produce and white elephants should be sent to Mrs Willis, Wellington Road or Miss Lintott, Gordon Road, Horsham. The proceeds will be divided equally between CMS and SPG. Admission to Garden 6d. Tea 9d.